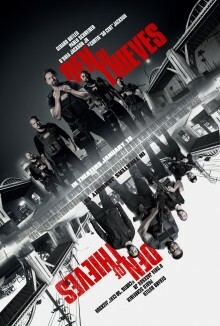 DEN OF THIEVES is a gritty Los Angeles crime saga which follows the intersecting and often personally connected lives of an elite unit of the LA County Sheriff’s Dept. and the state’s most successful bank robbery crew as the outlaws plan a seemingly impossible heist on the Federal Reserve Bank of downtown Los Angeles. Join LatinoScoop at an exclusive advance screening of DEN OF THIEVES in select locations below. Click on the link below for your city and enter the code. If you download a screening pass and aren’t able to use it, please share it with someone who can attend. There are limited number of passes available for each location. Screening passes are available on a first-come, first-serve basis. Additional passes will not be added once they are all redeemed. Anyone downloading a screening pass is advised to arrive early to secure seating. The theater is intentionally overbooked by the studio to ensure a full house. Plan accordingly to arrive with enough time. All advance screenings below will take place on Wednesday, January 17. The Los Angeles advance screening will take place on Tuesday, January 16 at 7:30PM.